We are Groot! When the Guardians attempt to evacuate a Kree prison planet and end up in a fight for their lives - what else is new? - they discover their old pal Groot is stretched a little thin. Someone is planting stolen branches of the monosyllabic hero and selling the saplings across the galaxy! 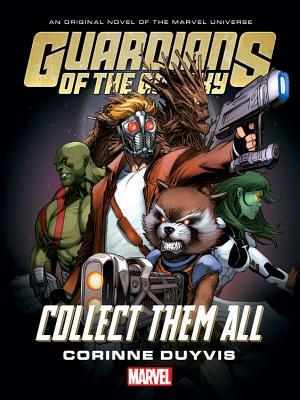 The search to find Groot's missing pieces forces the Guardians into an alliance with the unscrupulous Collector, but the real problem is more complicated than he wants them to believe. The seller is a kid. And she's got more than a few things in common with Gamora -like green skin and a wild temper. Now with an unruly teen in tow, the Guardians attempt to track down the remaining Groots - and discover an interplanetary conspiracy. War looms on the horizon. It's a race against the Collector, Groot himself, and the entire Kree armada. It's battle as Rocket likes it best. Sit back and watch the destruction as Corinne Duyvis, author of Otherbound and On the Edge of Gone, makes her Marvel debut!